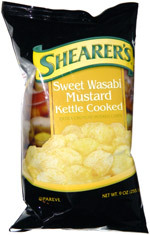 Taste test: These kettle-cooked potato chips had excellent crispness and crunch, enchanced by a tasty mustard flavor and a very slight hint of wasabi. There was just enough wasabi to taste, but not enough to have an actual wasabi kick. If you're in it just for the wasabi, there are much stronger wasabi chips out there, but these chips were quite good as mustard chips with a twist. Smell test: Nice sweet mustard smell.